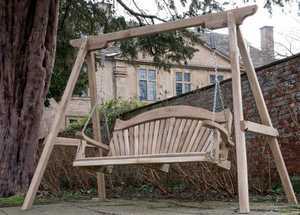 Can I leave my swing seat out over winter? It's a question we're often asked, and the answer is absolutely yes. It might surprise you to know that we actually recommend it. The changing seasons of our climates is a vital part of the wood maturing process, helping the wood mellow to a wonderful silvery colour. It's important to keep the wood clean and regularly treated to ensure it keeps looking it's best. You can find out more about cleaning and looking after your wooden furniture here. 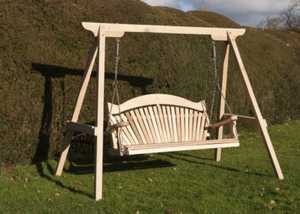 When we were asked to provide swing seats to the National Trust they were keen for us to set it up and make it look like a mature seat to match the other garden furniture.